Membership of the Mid Wales Model Engineering Society is open to everyone. All you need is an interest in engineering! If you would like to join us we would be delighted to welcome you to the club. Please email the secretary for more information. With the new running season coming up quicker than we think, maintenance work on the permanent way is necessary. If you would like to help us with this essential work, we would be delighted to see you! Please email the secretary to offer your services. We welcome prospective passengers of all ages to our railway in The Park in Newtown, Powys. Running dates are given below. The railway operates from around 11.00 to 15.30 approx on these days, weather permitting. Easter Monday 22nd April 11.00 to 15.30. 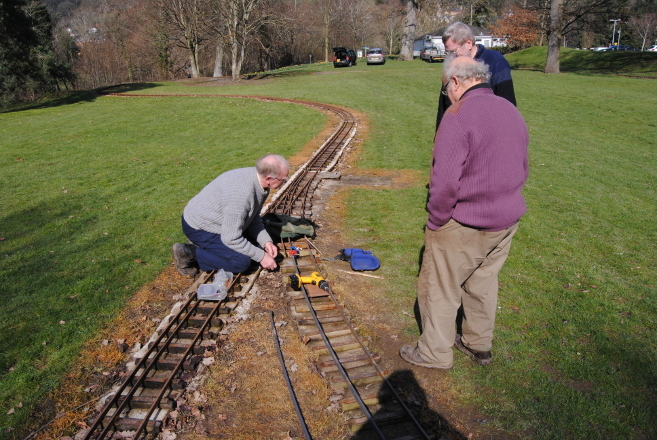 Railway operating subject to weather and ground conditions and availability of volunteer staff. E&OE. All events subject to alteration without notice. Members are most welcome to use the track to operate their locomotives at any time during daylight hours, though should you wish to do this, you must inform any member of the Committee beforehand. To ensure safety, a minimum of 2 people should be present, with at least 3 if passengers are being carried. Fares should be in the form of donations only. Engines must be compliant with regulations for operation in public places and have a current boiler certificate. c/o 10 Oldcastle Avenue, Guilsfield, Welshpool, Powys, SY21 9PA Wales, U. K.